I have been wanting to participate in the In My Beautiful Balloon Challenge in the Moxie Fab World, and I couldn't believe that Regina at The Cutting Cafe read my mind! She created two new sets of printable stamps that were perfect for this challenge! 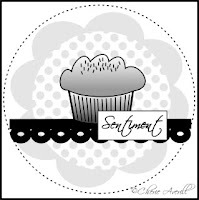 Cherie released a new sketch today at Sassy Lil Card Sketches, so it all just fell together perfectly for me this morning. Truly this card took me about 15 minutes to create. That is the beauty of having a great sketch (be sure to go HERE so you can see the monthly prizes) and fabulous printable stamps! I used Up in the Sky Wishes (over 120 images for $8.99) and Cloud Background (10 backgrounds for $2.25). What a great graduation card this would be! Or if you made just the card front, it would be a great page element. Oh my! I love this card! Great grad card. I can also see using this card to send a message of support and encouragment. Well, I guess I'm off to Cutting Cafe .... or should I say "soaring" over to Cutting Cafe! Thanks Brenda. You never cease to amaze me with one beautiful card after the next. I just love the theme of this! How stinkin' cute is that, my friend? LOVE it! So so cute! I love the color and scallop circle card! Wow, this is fabulous! Thanks for joining us at Sassy Lil Sketches this week.